BTU Technology BV, based in Budel, The Netherlands, has adapted its high-end sheetmetal-blank stacking equipment to develop a destacking system ideal for tailor-welded blank production. BTU’s stackers can stack in different patterns with different gap sizes to align the blanks for laser welding without any restacking or downtime. Options include vacuum or hybrid stacking for nonferrous materials (in addition to magnetic stacking for ferrous materials), as well as height adjustment, pop-up rollers and automatic pallet positioning. The use of soft head pusher ejection/pickup systems avoids damage to the product. 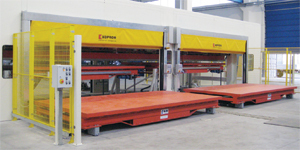 Lift tables accommodate as many as 36 stacks; blank size can reach 2000 by 5000 mm, or larger. Also available: profile-stacking equipment, turning devices and purlin stackers. See also: BTU Technology B.V.